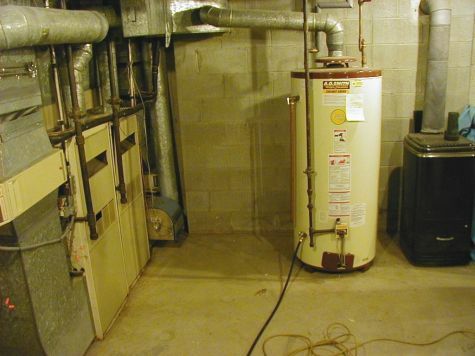 Before: Here is the old hot air furnace and direct gas fired water heater that we removed. 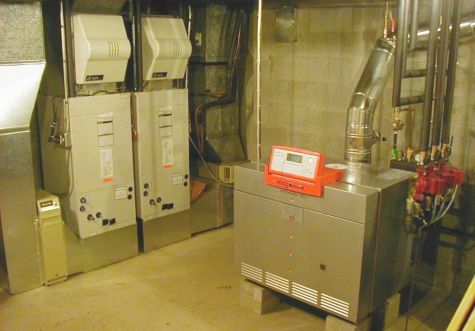 The upgrades to follow made the house more comfortable, more cost effective to heat, and reduced the homes impact on the environment through greatly reduced emissions and lower electrical consumption. 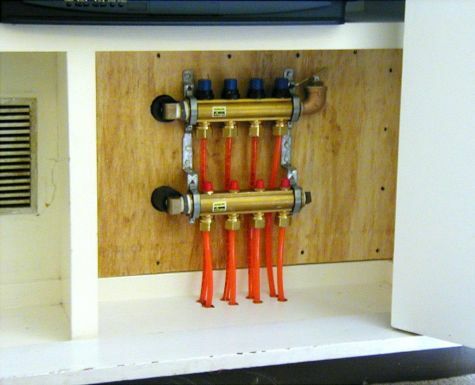 Stadler (Viega) milled, brass manifold, hidden in the bottom of some built ins, distributed heat to the stone walled, uninsulated family room through a Stadler (Viega) Climate Panel radiant floor on top of the existing slab. This was a home built in the 70’s with a finished basement. It had a hot air heating system and the ducting was underground! One room has stone walls without insulation and it was very uncomfortable. We were called to create a more comfortable system.